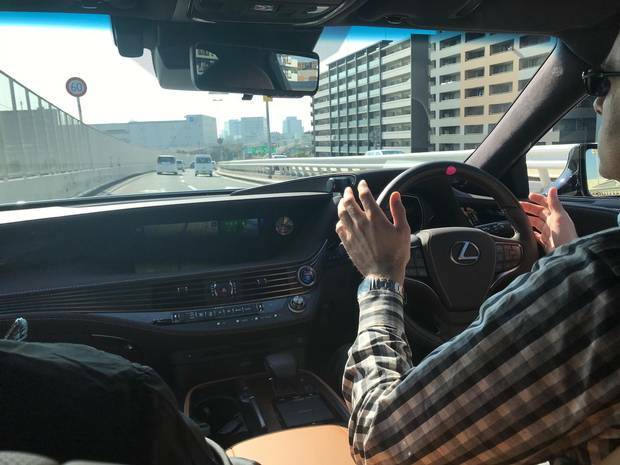 The Lexus LS+ is already capable of navigating a Tokyo highway on its own, without driver assistance. The 2020 Summer Olympics in Tokyo will be a showcase for autonomous vehicles if Japan Prime Minister Shinzo Abe gets his wish. He wants fleets of self-driving taxis, buses, trucks and private vehicles on Tokyo roads, even ferrying the athletes, by the time the world descends on the city. With an aging population and an economy bouncing in and out of recession, Abe sees the Olympics as an opportunity to encourage Japanese companies to spend and innovate. The lack of legal framework for self-driving cars remains a barrier to their roll-out in Canada and the rest of the world, but Abe's government is working on guidelines to clear a legal path. Tokyo aims to have the necessary legislation passed in 2019. At the Tokyo Motor Show last month, Lexus unveiled a semi-autonomous version of its LS sedan – called LS+ – that will be available in 2020. The car's "Highway Teammate" system, which has been in testing on public roads in Japan since 2015, allows "automated driving on highways from on-ramp all the way through to the off-ramp," and can perform manoeuvres like merging onto the highway, changing lanes and overtaking without driver assistance. But it's not clear if such a system would take responsibility from the driver (as in a Society of Automotive Engineers Level-3 autonomous vehicle) or if the system would act only as an assistant to a human driver (SAE Level-2). "Level-3 … is in limbo," said Kiyotaka Ise, chief safety officer and head of research and development for Toyota. "Perhaps Level-4 will make better sense. We're simultaneously developing solutions for both levels." At Level-4, the human doesn't need to be ready to resume control. Ise cited the car-to-driver handover time and human-machine interface as the biggest technical hurdles. For the Olympics, he said, Toyota wants to have prototype vehicles with its "Urban Teammate" system on the road. These vehicles would offer automated driving not just on highways but in cities, too. Nissan is also targeting 2020 for the evolution of its autonomous technology. The company plans to have cars on the road which offer driver-supervised automation in cities and at intersections, as Globe Drive has reported. Carlos Ghosn, Nissan's CEO, told reporters in Tokyo that the Japanese government seems to be the most willing to embrace autonomous driving technology. "The technology will be mass-marketed when governments want it," he said. "Our job is to make sure the technology is ready. So, I'm telling you, it will be ready by 2020." Nissan Motor Co.’s IMx EV concept vehicle is displayed during the Tokyo Motor Show at Tokyo Big Sight on Oct. 25, 2017. For 2020, Ghosn is ambitiously planning to have autonomous city driving available. Before then, he said, Nissan will also have autonomous highway driving and traffic jam assistance. Toyota is one of the main global sponsors of the 2020 Olympics, and Ghosn has been outspoken about his ambitions for Nissan. By comparison, Honda hasn't made much of a splash in the autonomous car world. The company is targeting 2020 for a vehicle that can take control in limited highway conditions (Level-3) and 2025 for its first Level-4 vehicle. Subaru was one of the first companies to offer advanced driver-assistance with its EyeSight stereo-camera system. In Japan, Subaru already offers vehicles with Tesla-like highway-only autopilot functionality. While the company hasn't announced anything specific for the Olympics, Subaru's Viziv concept from the Tokyo Motor Show is said to preview the next evolution of EyeSight. For 2020, the system will gain radar and accurate digital maps, which Subaru claims will allow for automated lane-changes in certain conditions. It's important to remember that all of these new semi-autonomous technologies being talked about are limited to certain environments – specific geo-fenced zones or highways-only or intersections-only – and certain (good) weather. Consumer vehicles without steering wheels are a long way off. We're talking baby steps here. "2020 is just three years down the road; it's not so much time," said Toru Saito, president of Audi Japan. "I don't think we're going to make a quantum leap to autonomous driving [by then]." The IMx zero emission concept car would allow the driver to deploy Nissan’s ProPILOT self-driving system. The steering wheel, brake and gas pedal could be retracted, providing the driver room to work or play while the car moved autonomously. Realistically, he said, there will be Level-3 vehicles on the road; Audi already has that technology in its A8 sedan. The only catch is Level-3 systems aren't legal; not yet, anyway. "I think they're going to change the law to accommodate autonomous driving by 2020," said Saito. "That is the government's target." To support development of autonomous vehicles, the Japanese government is working to create detailed digital maps of the country's road network, which it hopes to have completed for the Games. The last time Japan hosted the Olympics, in 1964, the Games spurred the country forward both economically and socially. That year, the Olympics saw the introduction of Japan's now-famous Shinkansen bullet train. Legalizing Level-3 cars could be the real breakthrough for 2020. "The one thing to know about Japan is that, if it sets its mind on something, it'll get it done," said Stephen Beatty, vice-president of Toyota Canada. "People align to those big goals. If this were North America … the jury would be out on our ability to handle it. But I never, ever, underestimate Japan's ability to set targets and hit them." Car companies are good at creating hype without necessarily being able to follow through. This time, however, they have the support of Japan's government, and the world will be watching. The writer was a guest of Audi at the Tokyo Motor Show. Content was not subject to approval.